Of all work related injuries, Carpal Tunnel is by far the most expensive! A Carpal Tunnel patient will lose approximately $30,000 when combining time away from work and medical bills. Carpal Tunnel is most common in women, and frequently found in manufacturing, sewing, fishing and cleaning industries. 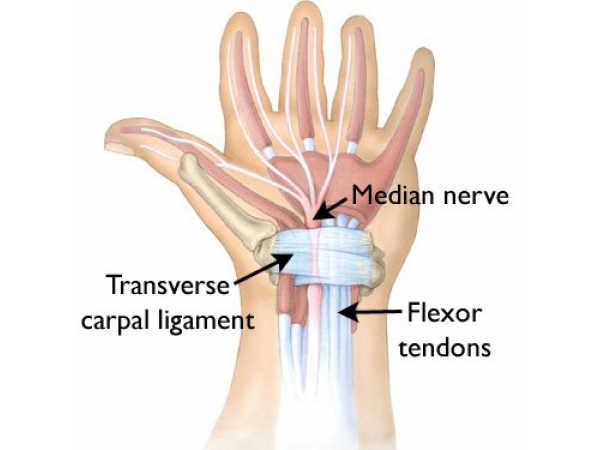 Carpal tunnel syndrome occurs when there is compression or entrapment of the median nerve within the wrist. It can occur due to injury, repetitive use of the wrist and hand, arthritis and even diabetes and hypothyroidism. Any condition that increases inflammation of the body or joints can cause carpal tunnel symptoms. Symptoms can vary for every person, but the most common being tingling, numbness, burning and/or itching in the palm, thumb or fingers. Pending on how severe, carpal tunnel may cause a weakened grip or atrophy in the muscles of the thumb. It is important if you think you have carpal tunnel you get properly diagnosed. Your doctor or chiropractor should fully examine the hands, arms, shoulders and neck to rule out other possibilities. They will complete tests to put pressure on the median nerve in an attempt to recreate symptoms. Not only is carpal tunnel the most expensive work related injury; it is also the most common surgical procedure in the United States! Prior to surgery there are a few other treatments to try. If you have the option to rest and avoid activities that worsen symptoms; those are most important to try. Next is working on controlling inflammation with ice packs. Don’t forget to visit your chiropractor! They are the only ones with expertise in wrist manipulation and mobilization to improve the alignment of the carpal tunnel. Over the last 10 years, we’ve had great success with carpal tunnel symptoms resolving with specific adjustments of the wrist. Vitamin B6/B12 : Studies are showing deficiencies in these vitamins among most who suffer from Carpal Tunnel. Acupuncture/Acupressure : Both help release blockages and improve the flow of energy. Those who are afraid of needles may try acupressure first. Yoga : Will help improve grip strength and decrease pain. You may need to start with modified poses that put heavy pressure on the wrists. Chiropractic : Chiropractors will manipulate the wrist and spine, apply ultrasound and work on the soft tissues to relieve symptoms. Anti-inflammatory Diet : Talk to your chiropractor or nutritionist about how to decrease your bodies inflammation. Make sure to talk to your doctor, chiropractor or nutritionist when it comes to supplementation. Supplements should always be regulated, and be of the purist form possible to see results. If you have questions regarding Carpal Tunnel or what you can do to relieve your pain, please contact our office.